Oats Pongal is a tasty recipe for people who have diabetics. I am not a big fan of Oats, but my hubby is. I make Oats Curd Rice often as it is similar to Curd Rice. When my parents came here for my second delivery, I made this dish for my father and hubby. Both of them loved it. 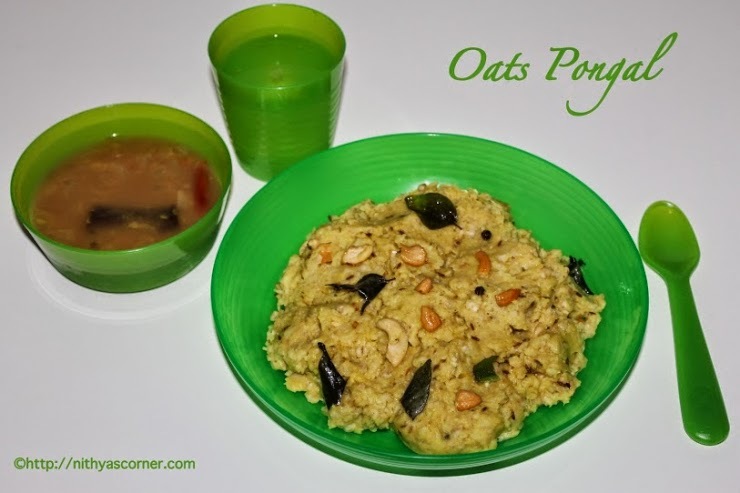 Oats Pongal will taste good when eaten hot. My friends have tried this recipe and liked it a lot. 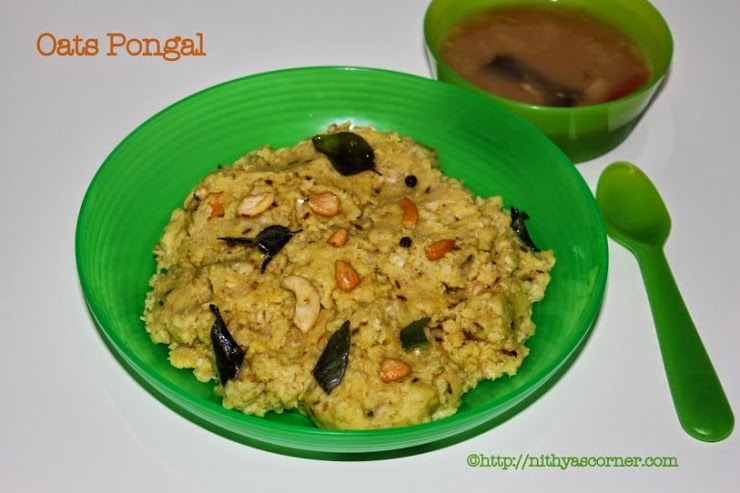 Oats Pongal is simple and easy to make. 1. Pressure cook moong dal using 1.5 cups of water for 4 to 5 whistles or until it becomes mushy. 2. Dry fry oats for 2 to 3 minutes in a wide pan. Oats will turn light brown in color. Transfer the oats to a bowl. 3. In a wide-bottomed pan, boil half cup of water and then add the fried oats. Boil the oats well for 2 to 3 minutes. 4. Add the cooked moong dal and mix well. Now add turmeric powder and salt. Mix well again, and cook until you get a porridge (semi-thick) consistency. 5. In a small pan, heat Ghee and add cumin seeds, peppercorns or pepper powder, finely grated ginger, green chillies, asafoetida, curry leaves, and cashew nuts in an order. Then add the seasoning to the cooked oats+moong dal mixture and give a quick stir. Now, Oats Pongal is ready! Serve hot with a drizzle of Ghee on top, and eat it along with Hotel Style Coconut Chutney and Tiffin Sambar. You can vegetables like carrot, peas and corn. Whole black pepper can be used instead of crushed pepper. You can use oil instead of Ghee but Ghee gives a very good flavor. 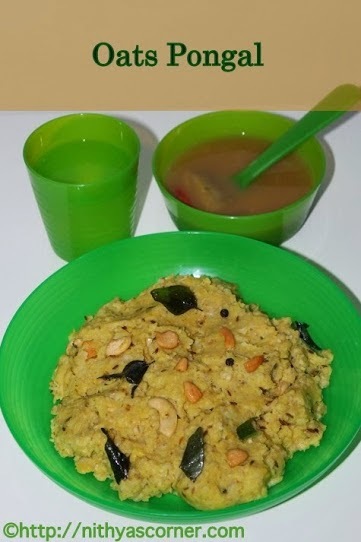 This entry was posted in Pongal and tagged curd rice, Oats Pongal, pepper powder, Pongal, Turmeric Powder on November 22, 2014 by vikashbhardwaz. A pongal with a twist - A flavorful combination of palak, brinjal, and dal! I have tasted this pongal in my friend’s house. I wanted to try it out at home. She gave me the recipe and said the recipe is present in Chef Mallika Badrinath’s book. I tried it out, and it was very delicious. The kids will like this pongal very much because of its subtle flavor. I have not tasted any greens pongal like this before. Absolutely, delicious pongal. Thank you Chef! If you have not tasted it before, try it out. You will definitely like it. Slitted green chillies – 4 to 7 nos. Chopped tomato – 2 nos. Chopped brinjal – 2 or 3 nos. Curry leaves – 10 to 12 nos. 1. In a pan, dry fry rice and Yellow moong dal until it becomes slightly brown. 2. In a cooker, heat oil. Add green chillies, onion and fry until they become translucent. Add brinjal and tomato. Fry well and then add spinach. 3. When spinach has boiled well, add grated ginger, garam masala powder, and salt. Add 4 to 5 cups of water. 4. When water boils well, add rice and Yellow moong dal. Boil for 10 minutes. 5. Meanwhile, fry cumin seeds, cashew nuts, and curry leaves in Ghee. 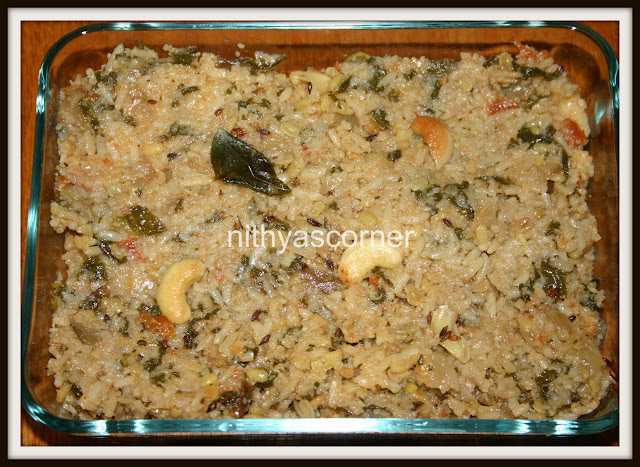 Add the fried cumin seeds, cashew nuts and curry leaves to the pongal. Garnish the pongal with the remaining Ghee. Now, Palak Masala Pongal is ready!!! This entry was posted in Pongal and tagged Curry Leaves, Palak Masala Pongal on November 22, 2014 by vikashbhardwaz.